It is truly a remarkable time to be a gamer. Ten years ago, who would have thought that Jeff Goldblum would be starring in a Call of Duty game, much less a mode within that franchise dedicated to the annihilation of the walking dead. Life certainly finds a way, Mr. Goldblum, to prolong your career. As the medium becomes increasingly more cinematic, games are also becoming so complex and dense that it sometimes seems we judge them based on their ability to scare players away from actually digging into them. Having played through some huge games this year, including Dying Light, Witcher 3, Metal Gear Sold V and Fallout 4, it makes one thirst for one of those rare occasions when a game shines not because of its excess, but because of its simplicity. Katamari Damacy had many things going for it, but most important was the purity of its central conceit and its accessibility. The game charged you, the Prince of the Cosmos, with cleaning up the mess after your father accidentally destroys the stars in the sky. How did you do this? By rolling a ball around Earth, picking up everything from thumbtacks to skyscrapers along the way, until your “katamari” reached the desired size (with a time limit, of course, to inject some challenge). That ball of junk was then magically turned into a star (I know, I know, but stick with me). The straightforward premise was complemented by fantastically implemented gameplay. By keeping the controls simple (the player only had to move their katamari with the analog sticks), the game was easy to jump into and has aged fairly well. 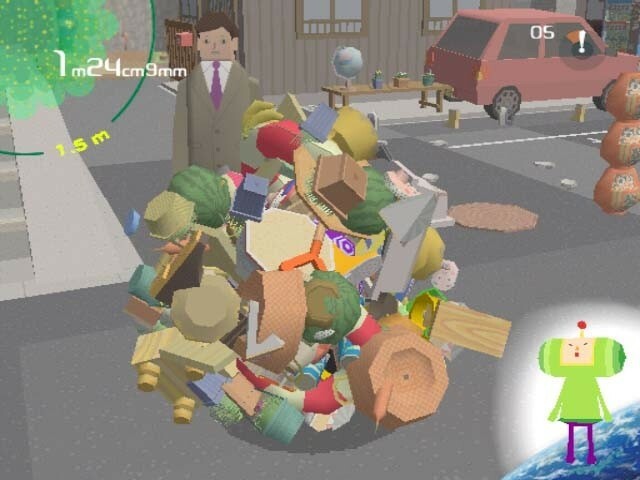 The games “physics” (if the ludicrous nature of the plot allows for such formalities), which required the katamari reach certain sizes to “increase its gravity”, and thus roll up larger objects, worked as a smart limitation on what otherwise felt like playing God. Few things in gaming have been funnier than watching innocent civilians struggle and cry out as they were rolled up in a huge ball of garbage. Graphically, the game was never breaking any barriers. But the geometric graphics worked well, and created an art style all its own. At a time when gaming was growing increasingly dark, when we began moving towards the muted color pallets that would dominate first person shooters, the bright and joyful world of Katamari Damacy really stood out. It would be interesting to see this game up-rendered, especially if they could enhance some of the color of the original. The game also had a phenomenal soundtrack. From menu and cut scene backgrounds to those lounge jazz and J-pop inspired tracks that play while you decimate city skylines, this game was a gem in the audio department. Sure, the game was short, and somewhat repetitive. But so is Tetris, and there is a good reason that game comes out on just about every platform that has and ever will exist. Katamari Damacy is not a game that I will marathon for 30 hours. It is a game, however, that over ten years later still tempts me to jump back now and again for a play session that is guaranteed to be enjoyable. That would be far easier if I could download it to my PS4.